Note: This report is currently only available in POS. A future release will make this report available in the Home Office. 1. 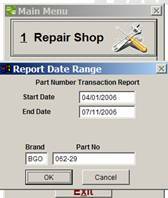 In POS, go to your Reports Menu and select the Part Number Transactions Report. � Enter the Part Number to be reviewed, press ENTER. The part number will appear in the upper left hand portion of the report. 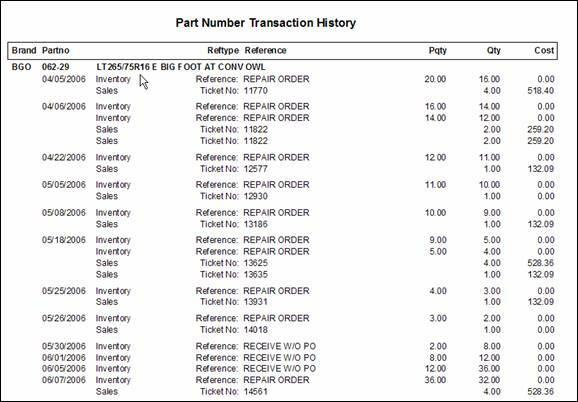 � The third column, Reftype Reference, will refer to the transaction triggers � for example, part number quantity affected by a sale or received with or without a Purchase Order. Individual details for sales transactions will be shown after the part number reference. � The fourth column, Pqty, shows the starting inventory quantity, before the individual transactions. This quantity will always be the same as the ending quantity from the previous transaction. In the example below, the following information can be obtained. � On 4/6/06, the starting inventory is the same as the previous day. (16) Two individual sales transactions changed the inventory. Ticket Number 11822 contained two individual line items, each with a quantity of 2. The first line item of 2 parts sold changed the inventory from 16 to 14, the second line item of 2 parts sold changed the inventory from 14 to 12. � On 5/30/06, the quantity on hand of this part is 2. I received 6 into inventory (without a PO) with brings my on-hand up to 8. � On 6/1/06, an additional 4 were received into inventory without a PO, bringing the quantity up to 12. Receiving Cost is not reflected in this report.